Theordore Wells, 95, Guernsey County's last surviving veteran of the Civil War and one of Cambridge's oldest residents, passed away Monday evening at 6:30 o'clock at his home, Clark St. and Edgeworth Ave., following a brief illness of complications incident to advanced age. Comrade Wells and his wife participated in the Victory Parade, which officially opened the sale of Defense Stamps and Bonds here on Dec. 18th, and he had been bedfast since two days after the parade. 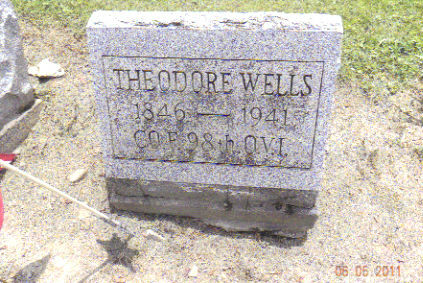 The deceased was born near Plainfield, Coshocton County, on March 1, 1846, a son of Isaac and Mary A Smith Wells. He lived there until he was 13 years of age when he moved to Mt. Pleasant, Jefferson County, after his mother married again following the death of his father in 1856. Remaining in Mt. Pleasant until the Civil War he enlisted in Company F. 96th Ohio Volunteer Infantry, when but two months short of being 18 years of age. He was sent to Chattanooga and remained there until 1864, when he joined the forces of General Wm. T. Sherman in his famous march to the sea. A musket ball cut short Comrade Wells' participation in the famous march for he was shot at Kenesaw Mountain, GA., on June 27, 1864. He rejoined his regiment early in the winter of 1865 at Raleigh, N. C., but Lee's surrender to Grant came shortly after that. In the spring of 1866, Mr. Wells came to Guernsey County and entered in business at Senecaville. Not satisfied with results of the new enterprise, he disposed of his interests and moved to Flat Ridge community, Jefferson township, where he boarded at the home of Abner Howell, father of a six-year-old daughter, Amanda, who many years later became Wells' second wife. Mr. Wells followed the carpentry trade, dairy work and farming until about nine years ago when he retired. He farmed in Guernsey county about 25 years. He then returned to Mt. Pleasant, remained there for about 10 years and then moved to Cadiz from which he place he moved to Cambridge about 4-1/2 years ago. His first wife was Miss Isabelle Ferguson of Indian Camp, who died in 1931. On April 21, 1939, he was married to Mrs. Amanda Howell Kennedy, and they moved to the home on Clark St., where his death occurred. In addition to his widow he is survived by three children, Mrs. Rupert Kaufman, Cadiz, Craig Wells, Mt. Pleasant, and Elmer Wells, Freeport. Following the war, Mr. Wells became active in veterans' affairs and was several times commander of the J. S. McCready Post No. 456 Grand Army of the Republic, at Cadiz. He also served as commander of the department of the Ohio G. A. R. and was a member of a number of commissions for the national organization. The deceased led an exceedingly active life and was held in high esteem by a legion of firends. He was a member of the Presbyterian church and was an elder of the Mt. Pleasant Presbyterian church. The body was removed to the Stevens & McCracken funeral home, S. Eighth St.
Funeral services will be conducted Thursday at 10 a.m. at the home, by Rev. C. K. McGeorge of the First U. P. church, with additional rites at 2 p.m. at the Cadiz Presbyterian church with the pastor, Rev. Mr. Lippincott, in charge. Burial will be made in Cadiz cemetery. The body will be returned to the home Tuesday evening.